People exercise for many different reasons. Some want to lose weight, reach a fitness goal or because their Doctor said they should, but did you know that exercise is one of the best ways to stay young? Feeling and looking young is an attitude and part of that is feeling healthy and having minimal stress. Exercise can help with both of these states of mind. Exercise will also help you to look younger which can improve your confidence. What exercises should you do to stay young? Here are a few examples. One of the best ways to stay young is to protect yourself from disease. This includes obesity and heart disease. Cardiovascular exercises are crucial to fighting these diseases that will not only make you feel older but will make you look older as well. Depending on your level of fitness there are different options for cardiovascular exercises including running, jogging, walking, aerobic classes or swimming. Find something you enjoy doing and try to do it three times a week. Another disease to consider, particularly in women is osteoporosis. As women age and their hormones change their bones can become weak and lose density. Osteoporosis will affect your physical age in many ways. It affects your mobility and can leave you looking weak and frail. Surprisingly, strength training is the best way to combat osteoporosis. Start with light weights if you’ve never done strength work before and I recommend working with a trainer who can teach you proper form to avoid injury. Stretching and working on flexibility will also help you feel and look younger. When our muscles and joints are weak or tight we walk more laboured and find it difficult to bend and reach. Yoga or other forms of stretching are great ways to improve your mobility. Start with a beginners class and let the instructor know of any injuries or weaknesses that may hinder your exercise. It’s important to remember that whatever your age if you are starting a new exercise program you should always consult your Doctor or a fitness professional prior to starting. A trainer will work with you to develop the most suitable program for you and your goals and will also ensure that you don’t injure yourself. Trainers are also great at motivating you and you’ll be pleasantly surprised at what you can accomplish. To stay young use diet and exercise to keep your physical age lower than your chronological age. 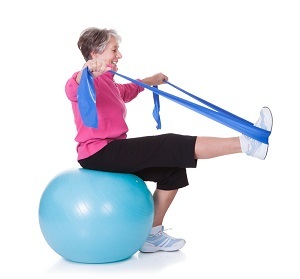 Exercise will help with your posture, muscle and bone density, flexibility and will fight off disease. Linked with the right diet you’ll be feeling and looking much younger than the number of candles on your Birthday cake.